Americans will be celebrating the Fourth of July this weekend, and that means loads of hot dogs, hamburgers, corn on the cob, watermelon, and, the perennial favorite, potato salad. Although most people will be enjoying traditional American-style potato salad with mayo, I won't, and neither will anybody in my family. Why? Because when my brothers and I were kids, my mother wouldn't dream of letting us eat mayo-based potato salad at cookouts. After all, how could she know how long it had been baking in the sun? There was no way she was going to risk her brood getting food poisoning, so we either skipped the potato salad or had our own olive oil and vinegar based potato salad instead. Use waxy rather than floury potatoes, such as Yukon gold, red bliss and fingerlings. They have a creamy texture yet keep their shape well when cooked. Although russet potatoes are exceptionally tender, they don't hold their shape well when boiled and tend to get mushy. 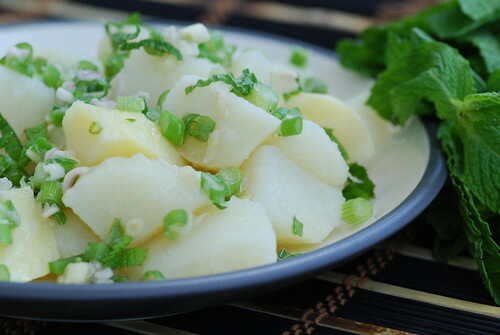 Cut potatoes into equal-sized pieces so they will cook evenly. Don't overcook potatoes. Take them off the heat while they're still slightly firm. Drain and let cool before assembling the salad. With or without skins? It's a personal preference. If you leave the skins on, be sure to scrub them well before cooking. Peeled potatoes work especially well for absorbing sauces such as pesto. Season the potatoes while still warm to absorb the flavors more fully. 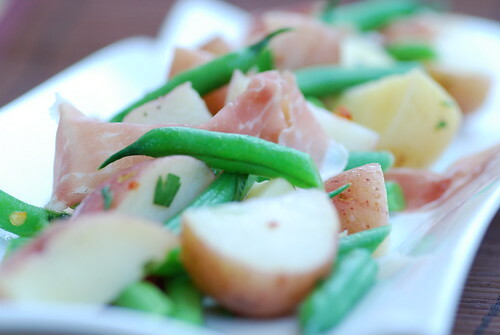 Warm potato salads taste best the day they are made; however, cold potato salads often taste better the next day. If you're making potato salad ahead of time, hold off on adding raw onions or fresh herbs until just before serving. You'll avoid unpleasant pungency and keep your herbs looking fresh. So here's wishing my fellow Americans a safe and spectacular Fourth of July weekend with lots of good friends, lots of sparklers, and lots and lots of potato salad. Wow love all of them, i just made some baked potato snack the other day, love them in salads! I do like the way the flavor of oil and vinegar permeates the salad, and those purple potatos are totally gorgeous! These look so great - I love the idea of using purple potatoes for a festive burst of color -- especially on the fourth! It seems that everyone can get those beautiful purple potatoes in their neighborhood but me. I would love to use them in one of these potato salads. Maybe I can score some at an out-of-town farmers market this weekend! I also prefer the potato salad with olive oil instead of Mayo. All your salads sound delicious. Happy 4th of July. Terrific! I'll take them all three! Yummy! The salads look great. I am not a fan of the traditional potato salad with mayo, etc. I am glad you did a twist on the "classic." parita-You can't beat a good spud. tw-I love the brilliant color too. Thanks! maris-They do add a splash of color! karen-They sell them at Trader Joe's too if you have one. All three look terrific and packed with great flavours!! I just wanted to say the photos on your blog are AMAZING! Very nice collection of recipes. You know, I have never tasted lemongrass: I must remedy this gap in my experience. Have a fabulous weekend! Your photos on your blog are so beautiful! The string bean salad looks so good! I like potato salads with an olive oil emulsion, too. I like using russets for my "mashed potato salad"... just for the reason you mentioned... they tend to get mushy (or 'mashy') and so creamy! I have 3 potato salad recipes. I make a potato salad w/ herbs and no mayo....oil & vinegar. An old school (my fave) w/ tons of Hellman's mayo, pickle relish and eggs. I could eat potato salad everyday. Scary. I have more spinach pesto in the fridge, and now I'm thinking about pairing it with cooked potatoes, like the arugula pesto recipe. My MIL made a potato salad recently with new potatoes and it tasted so good, even with mayo and I'm normally not a mayo person. I think I was just happy to have potato salad- there's something so 'American' about it. I want to make all four. Gorgeous, as always! The arugula pesto one sounds amazing!!! I'm not a huge potato salad fan because I always feel they need to be kicked up a notch or two. And these ones are!! Yum I'll take a scoop of each please! I don't think I've ever turned down a potato salad. All four look delicious. I am still a fan of mayo, too, though. It's a giant weakness of mine. Happy Independence to you and the family! 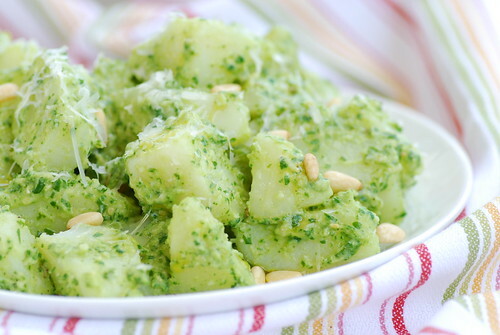 Great potato salad variations -- and how can you have a July 4 without potato salad? I've been making a roasted potato salad lately, and it's a nice twist on the theme. Love potatoes any which way. Happy 4th of July, Susan. Have a great weekend. Great selection! Great tips!! A good potato salad is like a good pasta salad: there's more to it than just tossing it with mayo! Love the lemon grass & ginger! i hate mayo, but love the olive oil... so warm 7 flavorful. I love your patriotic salad...it looks SO festive!! Wow, I never knew there was such a thing as a "blue potato"! Pretty neat. Love them all! Wow, I can't wait to eat those dishes. There very mouth watering and I guess there are healthy too. Susan, the summer has only just begun and there are plenty of days left to try and enjoy all these spud salad dishes. I love the first one with purple potatoes! Love all this salads hard to pick between pesto arugula and lemongrass ginger! Never met a potato I didn't like...but never seen so many good salad choices. Each one is special Susan. I am intrigued by the lemongrass & ginger one though. YUM!! I love my spuds! 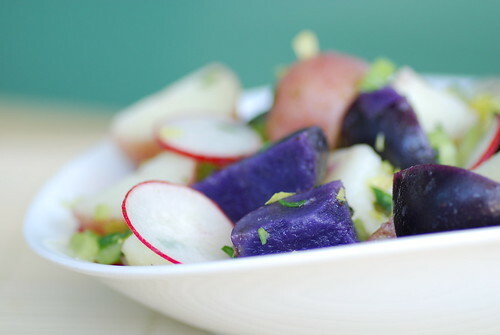 I love the idea of a red white and blue potato salad!